Baby is born. Loving, doting parents do everything in their power to keep child from crying. At the first sign of a whimper, baby is picked up and enthusiastically engaged. Bottle/breast is usually offered, especially if it is at night. Because it's night and nighttime is for eating being quiet and going back to sleep as quickly as possible without disturbing anyone. Toddler wants a treat at the grocery store. Parent says no. Toddler has feelings that come with noises. Parent gives toddler what he wants so as not to make a scene. And makes a note to self to never enter a grocery store without an endless supply of snacks. Toddler doesn't eat the healthy dinner that is given to her. Two days in a row. Parent panics because child is clearly malnourished and offers every food available in the house. Success! Toddler eats bread and strawberry yogurt! The third night, toddler is presented with dinner. She immediately throws a fit and then throws her peas. Parent whips out that bread and yogurt in two seconds flat. Baby smiles. Toddler is using mom as an all-night milk buffet. Mom is increasingly exhausted. Even her vision is blurry. She thinks she's depressed and is considering medication. She's considered night-weaning a hundred thousand times and even tried a handful of times, but oh how that toddler cries. It feels wrong. It feels unresponsive. It feels heartless. It doesn't even feel possible. Mom gives up every time. Four-year-old has a tantrum because his socks don't feel right. Parent tries fixing them once. They still don't feel right. Parent immediately gets angry and snaps at child. 'Socks are not anything to have a tantrum about! You're making us late for story time!' Child still feels that socks are worth crying about. Parent whisks child to the car barefoot and ignores him all the way to the library. Or continues to chastise him for crying about something so insignificant. Five-year old falls down and skins his knee at a public playground. He cries loudly. Parent comforts him and shushes him and comforts him and shushes him and then points out that everyone is looking at him. 'You're okay. Crying doesn't make it feel better. You're hurting my ears. You're a tough guy!' Child stops crying and snuffles loudly instead. Seven-year old middle child constantly wants alone time with parent. But she has three other siblings that make this challenging. Every time parent is engaged one-on-one with her and a sibling enters the space, she rather forcefully tells them to leave. Parent sternly tells child to be kind and that God did not make her an only child. He gave her three siblings, which is obviously even better. Child's feelings go unacknowledged and she if forced to either leave the game all together or play with everyone. 'I'm GOING.' And then he splashes her. With his toe. In her face. Repeatedly. While she's teaching another mother and her child how to swim. She says nothing and he walks away toward the changing room. 'You have to get out when I say! If you don't there's going to be trouble!' she calls after him weakly, a halfhearted attempt to reclaim an ounce of dignity. A few of these incidents I observed just this week and I'm not gonna lie: I had some big feelings of my own. Some big judgy feelings. And then I looked at my own parenting. Hence a good portion of the examples above. I'm going to go out on a limb here and say big feelings make us nervous. At first this discomfort comes from wanting to be good parents. To meet all of our tiny, perfect baby's needs. To be responsive and respectful. We spend tremendous amounts of energy trying to predict upsets and avoid them. And then, a switch is flipped in the parent's brain somewhere between babyhood and childhood. The parent is still trying to control emotional outbursts, but now it is out of fear. The child is bigger, louder, far more complex, definitely more volatile. And the parent realizes, more and more every day, that they are less and less in control of this small dictator. Fear often slides into anger. You are capable of hard things. I see you. I am in the process of night weaning my one-year old. I've been in this process for months now. But two nights ago it occurred to me that I was missing that second piece. I believed she could do it. But I was not compassionately bearing witness to her experience. The moment I realized that, I stopped feeling frustrated by her lengthy crying and instead felt compassion for this really hard thing she was having to do. I didn't fix anything. I didn't even do anything different, but she knew I knew. I know she did. And it mattered to her. Last night she slept through the night without making a peep. I discovered a book at the library a couple weeks ago called The Rabbit Listened by Cori Doerrfeld. A terrible thing happens to Taylor and a succession of animals tell him how he should process his loss. Taylor rejects them all. (S)he doesn't want to be fixed. Finally a rabbit comes and quietly sits next to Taylor, just listening. The rabbit creates the space Taylor needs to process his/her own feelings and come to a state of peace again. It is a book I haven't stopped thinking about. What would the rabbit do? I ask myself when someone scrapes a knee. What would the rabbit do? I ask when two siblings are squabbling. What would the rabbit do? I ask instead of telling my children their own feelings aren't valid. I barely follow the news. I have a handful of bad excuses, but no good ones. Some things don't require you to follow the news, though. They infiltrate social media spaces, radio news headlines, and conversations with real humans in real life (remember when 'real life' didn't need to be categorized?) I haven't even read or heard any details about the last school shooting, but eventually, when something is ubiquitous enough, horrendous enough, and having to do with children--which I happen to have a number of--a shift from 'them' to 'us' takes place. Even for the deeply asleep, deeply privileged. Even for me. I'm just going to say it. Even though the shame of it is almost too heavy to crawl out from under. Today is the first day I actually feared for my children's safety. Today is the first day I can't wait to pick them up from school and get them home safe and sound. I know. My feelings are a watered down version of what every black and brown and Native parent in this country has felt for the last 500 years. What every Syrian and Iraqi and Afghani and...and...and parent feels every day. My feelings are not new. They are the opposite of new. They are just new to me. I haven't had to feel them until today. The good news is that the group of people who are 'privileged' is shrinking. The bad news is that the group of people who are 'privileged' is shrinking. These tragedies will end. But will it be before or after our own children are murdered? What if we saw all children as our children now. today? I don't pretend to know what policy changes need to occur, but I'm pretty convinced they will all start with heart changes. Olivia and I go way back. Actually, she hasn't a clue who I am, but I have loved her with all my heart ever since she moved the cat. 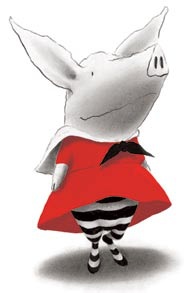 (For those of you who are wondering, why yes I did name my second daughter after a cartoon pig.) (And yes, they are shockingly similar in personality.) I first discovered her as a teenager while reading to two of my favorite small humans (who are not small anymore, but rather breathtaking young women.) Olivia gave us many perfect, joyful moments together and in return I gave her a spot in my heart. Skipping forward a few years, my college roommate gave me a stuffed Olivia for my birthday one year and logically she accompanied me to Haifa, Israel after graduation to work at the Baha'i World Centre. Where I met my future husband. Before Sisay and I got married, I was very forthcoming with him: there was no me without her. He accepted, though in retrospect he had no idea what he was getting into. Not very far into the deal it turned out sharing his wife with a stuffed animal wasn't actually working for him. It wasn’t his fault. How could he--how could anyone--have predicted such a thing? It just doesn't often come up in life. Who knew it was even possible for a grown man to be jealous of a stuffed animal? I wasted no time. I took Olivia in one hand and repeatedly slammed her body in a cabinet door. At which point his true feelings, previously masked, bubbled to the surface. ‘I didn’t mean like that!’ he said as he grabbed her from my hands and cradled her. But it was too late. I had killed her. Like actually. Except for a slight distortion of the emotions at play. (He wasn’t jealous. I don’t think.) But there was something disconcerting about his wife playing so exuberantly with a toy. And it did make him uncomfortable. Naturally. I’m uncomfortable right now telling you about my love affair with a 3" plush pig. I want to feel that kind of joy again. I think she's on to something. Queens are in the business of sovereignty. Plus they're girls. So basically they're all powerful bosses who have the capacity to create life. That's exactly what I need to do. I'm going to become queen, take the reigns of my own life, reincarnate my inner child, and reclaim my joy. My real children deserve that. I think I'm a princess. I read my children books about Malala and Rosa Parks and Ada Twist and Elizabeth Blackwell. We watched Katherine Johnson get men to the moon, in spite of the men on the ground. They still haven't seen Cinderella. We conduct science experiments and do math problems for fun because science and math are awesome. Especially when you're a girl. And you need them when you want to change the world. I try not to do for my children what they are capable of doing for themselves. I wear jeans everyday until pajama time because I can do ALL THE THINGS in jeans all while feeling comfortable in my skin. Sometimes I wear pajamas until pajama time. I have never worn heels in my entire life and cannot for the life of me understand why that could be considered a good idea. When I wear tinted chap stick, the kids ask why I'm so dressed up. I firmly believe that women and men are equally capable of working inside and outside the home in a fluid and fluctuating interchange. At the moment I work at home to raise my children because I want to and because I'm the one whose body makes milk and because we're okay with barely scraping by and because our life circumstances allow for it. Also, it's the most challenging, hardest job I can imagine and I believe I can do hard things. I believe my happiness depends on doing hard things. When my husband cleans the kitchen at the end of the day and tells me that he 'did the dishes for me,' I remind him that he did them for our family. And that we both work 24 hours a day, but he splits his time between two jobs and I stick with just the one. The never-ending, endlessly rewarding, endlessly exhausting one. Sometimes I thank him when I am genuinely grateful for all that he does, and often I don't because when he does the laundry or cleans the bathrooms or braids the girls' hair, he isn't doing me a favor. He's just doing his job. OUR job. Also, if its okay for him to say, 'I just can't tonight,' it's okay for me to say that too. And that, my fellow ladies, is probably the most liberating thing you can do for yourself. Stop. doing. more. than. you. can. Resentment doesn't come when your partner isn't pulling their weight. Resentment comes when you take it upon yourself to pull more than you are capable of pulling, and then blame your partner. "Who are you going to blame your life on today?" she asked. "There is only weakness to be had in waiting for somebody to change it for you... It is the weakest position you can stand in. I'm in charge of this person. Whatever happens out there is none of my business. I'm in charge of this soul that was given to me to take care of. And I accept 100% accountability for this soul." This. This is why I surround my children--and especially my girls--with examples of humans--and especially women--who took the souls they were given and honored the purpose for which they were created. And yet their mother--their first and arguably most important example--thinks she's a princess. I didn't know I thought this until I found myself standing at the kitchen sink the other night, washing dishes, suddenly awash in sadness. It's nothing new. Just the soul saying you could have done better today with what you were given. A healthy signal necessary to correct tomorrow's trajectory. That sadness used to morph into anger. Because blaming my husband for not doing x, y, or z was easier than owning my own feelings and acting on them. I still blame him sometimes, but I like to think I'm inching toward that 100% accountability. This night though, there was no anger. The sadness stayed sad. I noticed myself listening very closely for the sounds of my husband's footsteps coming down the hall. Waiting for him to notice my sadness. Waiting for him to rescue me. I'm Rapunzel, clinging fiercely to my own burdensome braid, waiting and hoping my prince will magically appear at the window to rescue me from my sadness, depression, anger, fear, dissatisfaction, discontent. I'm letting go now. I'm cutting that braid loose. I'm tired of waiting. I'm finding my own damn way out of this tower. It has been three months since Gloria's birth. Three months since she emerged from the darkness of the womb. I wonder what she was thinking during that long night. Her last night in the only world she knew. As the walls of her home closed in on her, literally forcing her out, was she conscious of hope? Or at least wonder? Or was it only fear? In the early stages of labor it was me who was consumed with fear, blood pressure through the roof, heartbeat racing. But her heart, perfect and steady, calmed me. My husband calmed me. Later, fear having left me, could she feel the fierceness of my love, my unshakeable trust in her and me and Him? I hope so. When she emerged, head swiveling in all directions, certainly then she felt wonder. Followed by the fear of finding yourself in a foreign country and recognizing absolutely nothing. Her cries felt panicked and incessant. But her cries also felt victorious. It meant that what we had just done was scary as hell, but we had done it anyway. We learned that we can do scary things. We can do hard things. Together. And isn't that what life should be about? This exchange of hope. The constant dance of reassuring whichever one is in need of reassurance in order to keep going. We seem to find ourselves at a major crossroads at this particular point in history. The place where all 7.5 billion of the world's people suddenly find themselves merging onto the same road, faced with the impossible task of crossing one bridge. Together. It feels dangerous. It feels highly unlikely. It feels terribly uncomfortable to be shoved up against so many who are so different from ourselves. But the momentum of an entire planet's worth of people makes us powerless to stop this process. “And so the mother in me asks, what if? What if this darkness is not the darkness of the tomb, but the darkness of the womb? What if our America is not dead, but a country that is waiting to be born? What if the story of America is one long labor? What if all of our grandfathers and grandmothers are standing behind us now—those who survived occupation and genocide, slavery and Jim Crow, detentions and political assault—what if they are whispering in our ear today, tonight “you are brave”? What if this is our nation’s great transition? I think, if we look with the 'eye of oneness,' we will see that we are all 'His glorious handiwork.' We are all family. In the truest possible sense. Gloria Leigh Sabera entered the world on January 9th, 2017 at 9:09 AM. It was 9 degrees outside. So our midwife, Robin, said when she arrived an hour earlier. I was aware only of bright sun on white snow. Of candles flickering in a row, given to us hours earlier at our blessing. Of kind hands and gentle, encouraging voices. Of quiet laughter and loud wails. The occasional thunk of wood falling in the wood stove. The sweet relief of hot water being poured by the potful into the birth tub. Of bones descending and a head full of hair making its way into the world. On Sunday, 12 days before her due date, after returning from children's class, my water started leaking a bit. I've never been this early before, nor had this happen, so I was wholly unconvinced that this was the beginning of labor. I fixed lunch, tidied the house (just in case), laid down for 20 minutes to put Isaiah to sleep, and went downstairs for the blessing my mom was hosting. In lieu of a gift, I had requested a reading to add to our blessing book, a candle to light at the birth, and a bead to contribute to the baby's first prayer beads. It was a sweet and beautiful afternoon- a reminder that we do not raise (or even birth) our children by ourselves, nor do they belong to us alone. A reminder I desperately needed--I have had a lot of anxiety during this pregnancy fueled by a hyperthyroid diagnosis at week 30 with potentially dire but unlikely consequences. Still, once fear is introduced, it is hard to eradicate. And because such a condition technically disqualified me from a home birth (though not literally since my midwives placed their whole trust in me), it did require a heightened level of monitoring and vigilance. And so, leading up to this birth, I have been humbled again and again, constantly reminded of the delicate balance between placing my whole trust in God and trusting wholly in my own ability to grow and deliver human life into the world. It is a strange place to live- between powerlessness and absolute power. But isn't that life? Realizing over and over that we are standing, yes, but standing because of and in the shadow of something greater than ourselves. I was in a good place. I could do this. The baby could do this. And the roomful of women--mothers and mothered--were a reminder that alone is just an illusion. But then I came upstairs. I was having more signs. Labor was looking more and more like a possibility. I grasped desperately for that confidence from earlier, but found fear instead, flapping its wings in the shadows. So I did the only logical thing: swept and mopped the floors. Lined up the candles on the window sill. Made space for the birth tub. Channeled the adrenaline. It took Sisay a while to take me seriously, but before going to bed he pulled the birth tub in from the porch and cleaned it out. (We had just picked it up two days prior, and almost hadn't at all.) I gave our midwife, Lindsay, a heads up, told her I wasn't sure yet where this was headed, and tried to get some rest. Unsuccessfully. My anxiety was mounting. My heart was racing. There wasn't enough oxygen in the air. There were lots of feelings and none of them were, 'You got this.' I asked Lindsay to come. Even if this wasn't it, I needed her. She arrived around 3 AM. We chatted, she took my blood pressure. It was so high she wouldn't even tell me what it was. I drank some chamomile tea, tried to lay down again. Finally I crawled into Sisay's arms and asked him to hold my heart 'so it wouldn't come out of my chest.' He did. For two hours. 'Safe' started to seep in at the edges. I dozed in and out of sleep. And then it was 6 AM. Like clockwork, all three children woke up. Sisay got up to deliver them to the grandparents downstairs. And suddenly a weight lifted off of me. I hadn't realized that having them in my birth space had impacted me so strongly. Immediately, a strong contraction pulsed through my body. I smiled. I almost laughed. Finally, labor was a reality. With each contraction, a wave of confidence rushed in, taking with it wave after wave of anxiety. 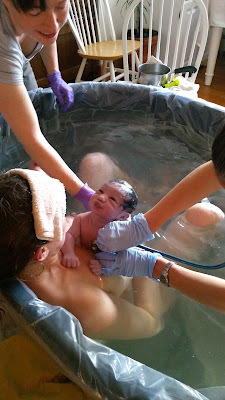 As soon as Sisay came back in, I asked him to fill the birth tub. 'So this is it?' he asked. 'Yes,' I smiled. 'This is definitely it." There wasn't space anymore for worry. My body took over and I gladly surrendered. I spent time on hands and knees on the bed, hung out in the living room while Lindsay put her magic hands on exactly the right spots. At 8 AM the tub was ready and I eagerly slid in. Our second midwife, Robin, arrived. We had just met her at our last appointment two days earlier, as she was just coming back from maternity leave. But midwives--good midwives--possess a certain ability to be both unobtrusive and fully present. She quietly and gracefully stepped in as my subtle cheerleader. By now, bright sunlight flooded the room. I was both acutely aware yet oddly removed from my surroundings. With each contraction, I felt for my baby's head, marveling at its journey through me. When my water broke, I felt my bones reconfigure as she descended through my pelvis. "I'm going to push her head out now," I announced. And with both tremendous effort--and restraint--I did. As soon as her head was birthed, she opened her eyes wide under water and swiveled her head all around to get a good look. I could still feel her kicking inside. And then out came a hand, waving at us. I held it until the next contraction. Lindsay wiggled her arm out and the rest of her followed. We pulled her up onto my chest together and suddenly I was staring into the face of our fourth child. Our perfect, tiny daughter. Sisay had been recording the birth in front of me and I quickly called him to the other side. "She's sticking her tongue out!" I laughed. I cried. I sighed. I did it. She did it. And we had not done it alone.